This is a rare treat though not many people enjoy the lamb. Actually I am not crazy about it either but on rare occasions I get a great recipe idea that really makes all the time spent cooking worthwhile. Now check this out, everybody loves gyros and souvlaki, right? 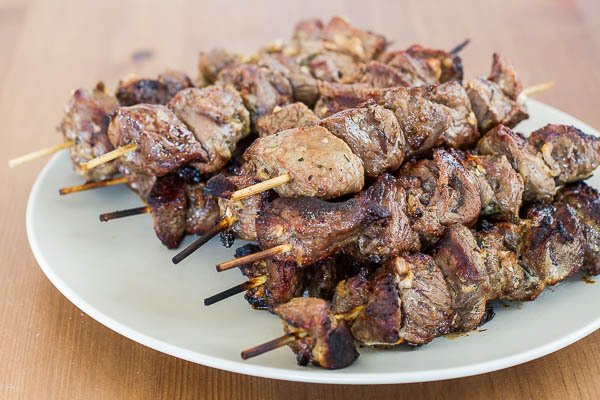 However, chicken or veal are pretty much the only two versions that you could find in North America but in Europe the lamb souvlaki is more popular and personally I love the way is cooked in a Greek restaurant. 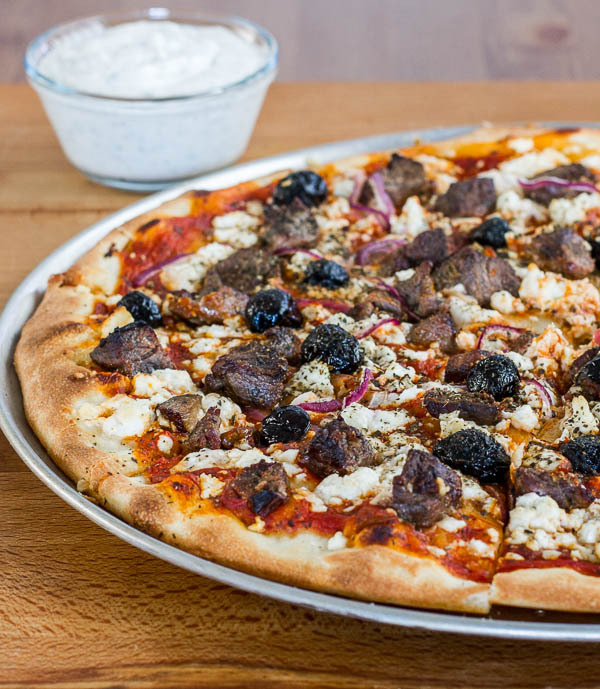 I could say the next step for me was obvious but I would be lying, I stuffed myself with LAMB SOUVLAKI few days before I got the idea of combining everything in a fantastic pizza. Again, I was about to say that this was the best pizza I ever had but I usually say it every time I bake a new type of pizza. You could check my pizza gallery for the whole list and let me know what you think. It’s funny how my initial idea was to create a baking website and I ended up focusing mainly on pizzas, I should probably create a pizzaglory.com as well (don’t steal my idea now). Anyway, enough chatting and let me walk you through the whole process of creating one of the most fantastic pizzas you will ever have. 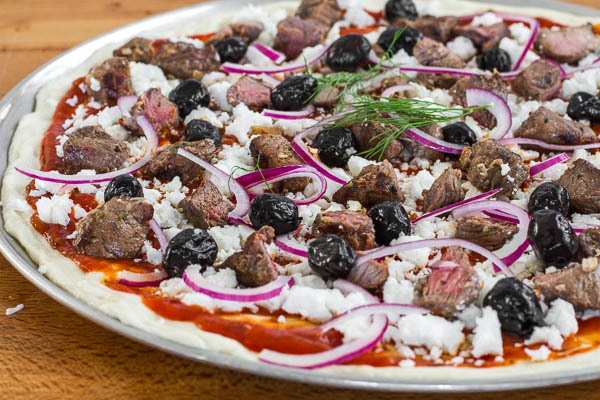 Next image is actually the souvlaki that I used on my pizza, I just cut those pieces a bit smaller to get more of them on the dough. You might want to click on the image if you want to get the recipe. You assemble the thing as you would do any other pizza, no big deal. Detailed info below in my recipe, just print it out. So, this is how mine looked just before the oven insertion ;). After 10-15 minutes of baking I had to fight for a piece. Between me, my wife and the freakin’ dog the struggle for a piece was pretty intense but trust me, the time spent cooking was well worth it. If you read this I urge you to try it but do not replace lamb with anything else. Cheers! Spread pizza sauce mixture over the crust. Top with feta cheese. 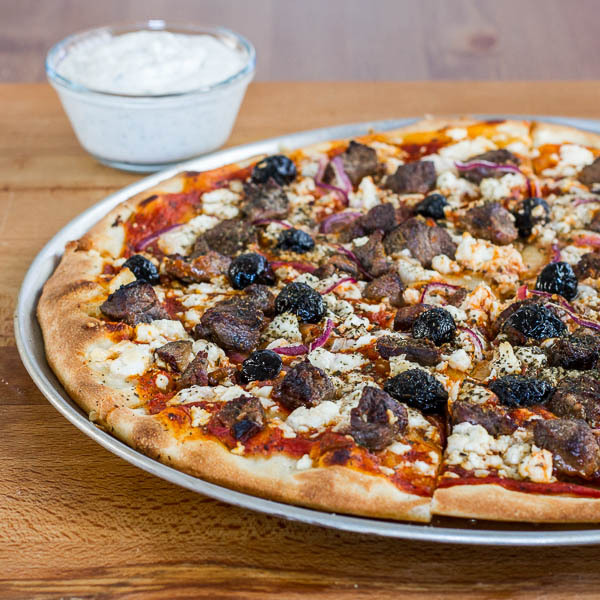 Top with the lamb evenly over the entire pizza. Top with red onions and olives and sprinkle the oregano over the entire pizza. Bake for 10 to 15 minutes or until crust is golden brown. Put the cucumber in a strainer set over a bowl. Sprinkle with ½ teaspoon salt and drain for 1 hour. Put the yogurt in another strainer set over a bowl and drain for 1 hour. Combine the cucumber and yogurt in a bowl with the remaining ingredients and stir well. Cover and chill for at least 1 hour before serving.